"This is the first commandment; the second is like it." Every priest, and indeed every Catholic, can sometimes find themselves in the position of someone asking This religion of yours  whats it all about, really, when you come down to it? Whats the bottom line? Our temptation might be to start going on at length, which is when we should remember this Gospel. Jesus, asked a very similar question, pins our faith down to two very simple things  love of God and love of neighbour  which together make up the foundation for everything else in our religion. The very simplicity of these two commandments is a gift, so that we can try to live them out each day of our lives. The first commandment, which is also that given by Moses in the first reading, is actually a prayer that our Jewish brothers and sisters still recite every single day. Jesus, our perfect High Priest, gives us these two commandments to be written in our heads and our hearts, to remember each day, so that we may conduct ourselves in the paths of the Kingdom of God. While this is a very short and straightforward reading on one level, it is also immensely significant and, in a way, solemn. Notice that twice in the short reading Moses says, Listen!. Your responsibility as a reader is to make sure that the congregation before you this Sunday listens to these words. Make sure you take your time  let the congregation settle and be still before you even start. Proclaim these words slowly and carefully  make sure there are plenty of pauses. Save something for the last paragraph: this is the prayer known as the Shema which is recited by Jewish people daily: the fact that Jesus will repeat these words in the Gospel today should make you think of the significance of these words. When you read this passage, you are not simply telling a story, but making a very solemn proclamation  try it out loud beforehand to see what this means for the way you read. 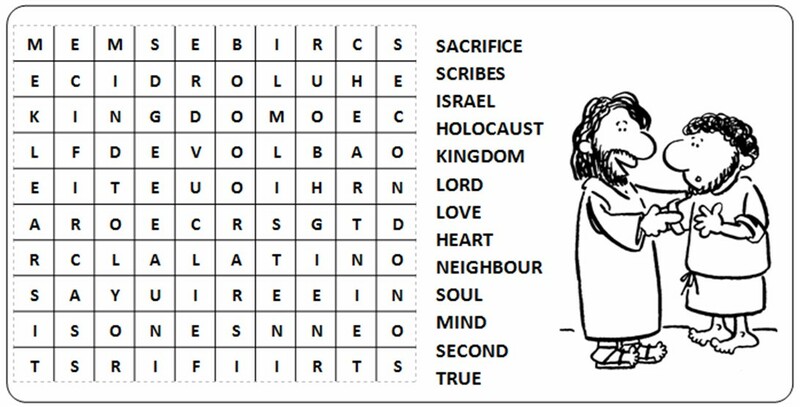 Click on the link to get the Sunday Wordsearch. Feel free to copy and paste it into your parish publications.